Although the diagnosis of cerebral salt-wasting syndrome is thought to be controversial by some,  it should be considered a discrete clinical entity and may be more common than perceived. It should also be considered in patients without cerebral disease. [2, 4] Possible mechanisms for cerebral salt-wasting syndrome are shown in the chart below. Possible mechanisms for cerebral salt-wasting syndrome. The injured brain may release natriuretic proteins that act directly on the kidney. In addition, cerebral injury may increase sympathetic nervous system activity, elevating renal perfusion pressure and releasing dopamine. Cerebral salt-wasting syndrome, or renal salt wasting, may be more common than SIADH and may even occur in the absence of cerebral disease. [2, 3, 5] Although the exact mechanism that underlies the development of cerebral salt-wasting syndrome is unclear, it is known that the initiating defect in renal sodium transport leads to extracellular volume depletion and that a cascade of compensatory changes occurs. Abnormalities in the proximal tubule result in excessive sodium losses, which lead to decreased effective circulating volume. This activates baroreceptors, which increase antidiuretic hormone (ADH) secretion. This results in water conservation and a return to an equilibrated state. In contrast, SIADH primarily occurs due to an inappropriate euvolemic rise in ADH secretion. The relationship among serum urate, fractional excretion of urate, and hyponatremia in cerebral salt-wasting syndrome is unclear. Fractional excretion of urate may remain elevated even after correction of hyponatremia in patients with cerebral salt-wasting syndrome. This is distinct from SIADH, in which the fractional excretion of urate returns to the reference range once the hyponatremia is corrected. The physiologic basis for this in cerebral salt-wasting syndrome may be related to the receptor-mediated processing of sodium and urate in the proximal tubule, which may be defective in this syndrome. The physiologic basis for hypouricemia in SIADH remains unclear. The exact mechanism underlying cerebral salt-wasting syndrome remains unclear. 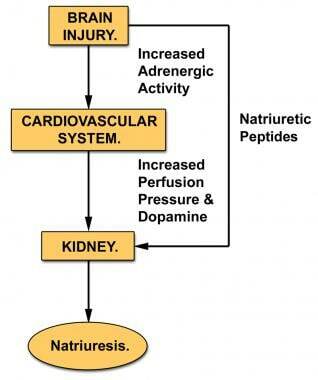 In the setting of cerebral injury, one hypothesis is that an exaggerated renal pressure–natriuresis response caused by increased activity of the sympathetic nervous system and dopamine release is responsible for urinary sodium loss. Exact incidence data for this disorder are not available. Approximately 60% of children with brain injuries or tumors develop hyponatremia during their hospital course. Some experts suggest that cerebral salt-wasting syndrome (renal salt wasting) is responsible for hyponatremia at least as often as SIADH is, particularly in neurosurgical patients. Other studies indicate that this syndrome explains the development of hyponatremia in no more than 6% of patients with acute brain injuries. A literature review by Leonard et al found the incidence of cerebral salt-wasting syndrome reported in traumatic brain injury to vary between 0.8-34.6%, with the studies determining these incidences differing with respect to the populations evaluated and the definitions used for hyponatremia and cerebral salt wasting. The exact incidence of renal salt-wasting syndrome without cerebral disease is also unknown. Cerebral salt-wasting syndrome can occur at any age. Published reports include patients aged 6 months to 65 years. Peters JP, Welt LG, Sims EA, et al. A salt-wasting syndrome associated with cerebral disease. Trans Assoc Am Physicians. 1950. 63:57-64. [Medline]. Bettinelli A, Longoni L, Tammaro F, Fare PB, Garzoni L, Bianchetti MG. Renal salt-wasting syndrome in children with intracranial disorders. Pediatr Nephrol. 2012 May. 27(5):733-9. [Medline]. Moritz ML. Syndrome of inappropriate antidiuresis and cerebral salt wasting syndrome: are they different and does it matter?. Pediatr Nephrol. 2012 May. 27(5):689-93. [Medline]. Maesaka JK, Miyawaki N, Palaia T, Fishbane S, Durham JH. Renal salt wasting without cerebral disease: diagnostic value of urate determinations in hyponatremia. Kidney Int. 2007 Apr. 71(8):822-6. [Medline]. Maesaka JK, Imbriano LJ, Ali NM, Ilamathi E. Is it cerebral or renal salt wasting?. Kidney Int. 2009 Nov. 76(9):934-8. [Medline]. Bitew S, Imbriano L, Miyawaki N, Fishbane S, Maesaka JK. More on renal salt wasting without cerebral disease: response to saline infusion. Clin J Am Soc Nephrol. 2009 Feb. 4(2):309-15. [Medline]. [Full Text]. Kao L, Al-Lawati Z, Vavao J, Steinberg GK, Katznelson L. Prevalence and clinical demographics of cerebral salt wasting in patients with aneurysmal subarachnoid hemorrhage. Pituitary. 2009. 12(4):347-51. [Medline]. Kojima J, Katayama Y, Moro N, et al. Cerebral salt wasting in subarachnoid hemorrhage rats: model, mechanism, and tool. Life Sci. 2005 Apr 1. 76(20):2361-70. [Medline]. Rivkees SA. Differentiating appropriate antidiuretic hormone secretion, inappropriate antidiuretic hormone secretion and cerebral salt wasting: the common, uncommon, and misnamed. Curr Opin Pediatr. 2008 Aug. 20(4):448-52. [Medline]. Leonard J, Garrett RE, Salottolo K, et al. Cerebral salt wasting after traumatic brain injury: a review of the literature. Scand J Trauma Resusc Emerg Med. 2015 Nov 11. 23:98. [Medline]. [Full Text]. Kalita J, Singh RK, Misra UK. Cerebral Salt Wasting Is the Most Common Cause of Hyponatremia in Stroke. J Stroke Cerebrovasc Dis. 2017 Jan 16. [Medline]. Misra UK, Kalita J, Kumar M, Neyaz Z. Hypovolemia due to cerebral salt wasting may contribute to stroke in tuberculous meningitis. QJM. 2018 Apr 9. [Medline]. Sherlock M, O'Sullivan E, Agha A, et al. Incidence and pathophysiology of severe hyponatraemia in neurosurgical patients. Postgrad Med J. 2009 Apr. 85(1002):171-5. [Medline]. Arieff AI, Gabbai R, Goldfine ID. Cerebral Salt-Wasting Syndrome: Diagnosis by Urine Sodium Excretion. Am J Med Sci. 2017 Oct. 354 (4):350-4. [Medline]. Wu X, Zhou X, Gao L, et al. Diagnosis and Management of Combined Central Diabetes Insipidus and Cerebral Salt Wasting Syndrome After Traumatic Brain Injury. World Neurosurg. 2016 Apr. 88:483-7. [Medline]. [Guideline] Rahman M, Friedman WA. Hyponatremia in neurosurgical patients: clinical guidelines development. Neurosurgery. 2009 Nov. 65(5):925-35; discussion 935-6. [Medline]. Maesaka J, Imbriano L, et al. Cerebral-renal salt wasting. Hyponatremia. New York: EE Simon, Springer; 2013. 65-85. Janus D, Wojcik M, Dolezal-Oltarzewska K, Kalicka-Kasperczyk A, Poplawska K, Starzyk JB. Cerebral salt wasting in a postoperative period. Neuro Endocrinol Lett. 2014. 35 (4):252-6. [Medline]. Jeon YJ, Lee HY, Jung IA, Cho WK, Cho B, Suh BK. Cerebral salt-wasting syndrome after hematopoietic stem cell transplantation in adolescents: 3 case reports. Ann Pediatr Endocrinol Metab. 2015 Dec. 20 (4):220-5. [Medline].